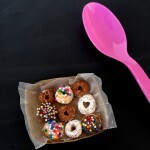 When I saw this giant donut wall at Create + Cultivate I was in awe. My first thought was every wall should look like this. 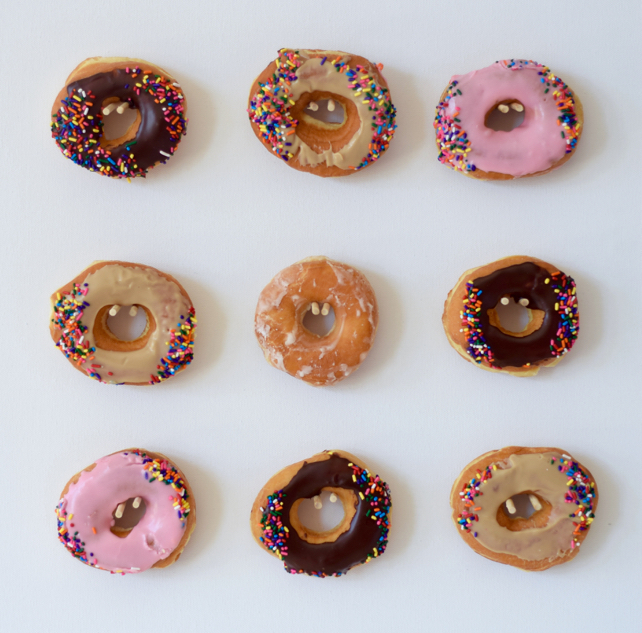 Imagine living in a world where every wall was covered in donuts? I think we might have found the answer to world peace, people! My second thought, once I realized my first wasn’t so realistic, was how perfect this would be for an event! 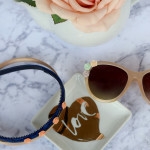 With some tips from my friends over at Lauren’s Lyst (one of my FAVORITE sites–make sure to check it out!) 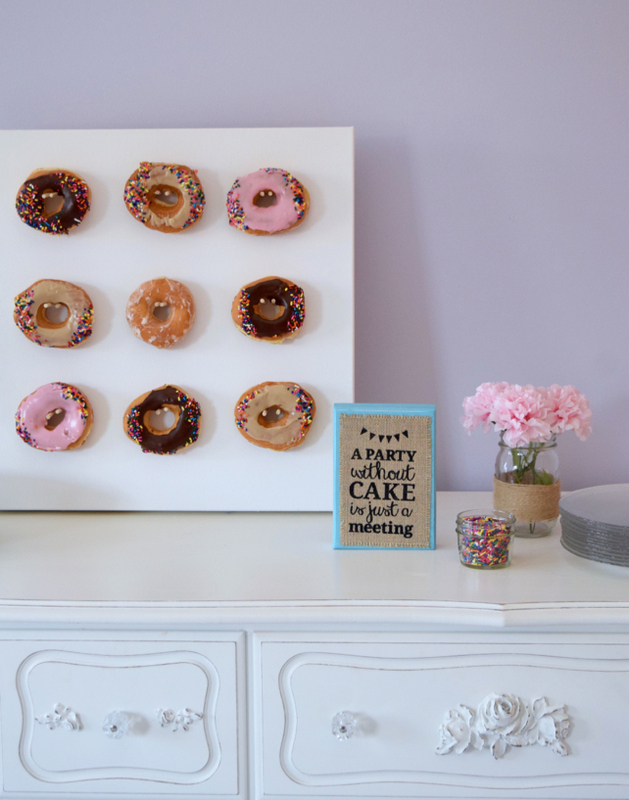 I recreated a mini donut wall that is a must for your holiday parties, birthdays, or Friday night in with the girls. 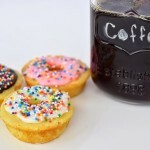 Use store bought donuts or make your own (bonus points!) 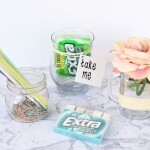 to recreate this decorative display. Make sure the canvas board you buy is mounted aka can stand on it’s own. 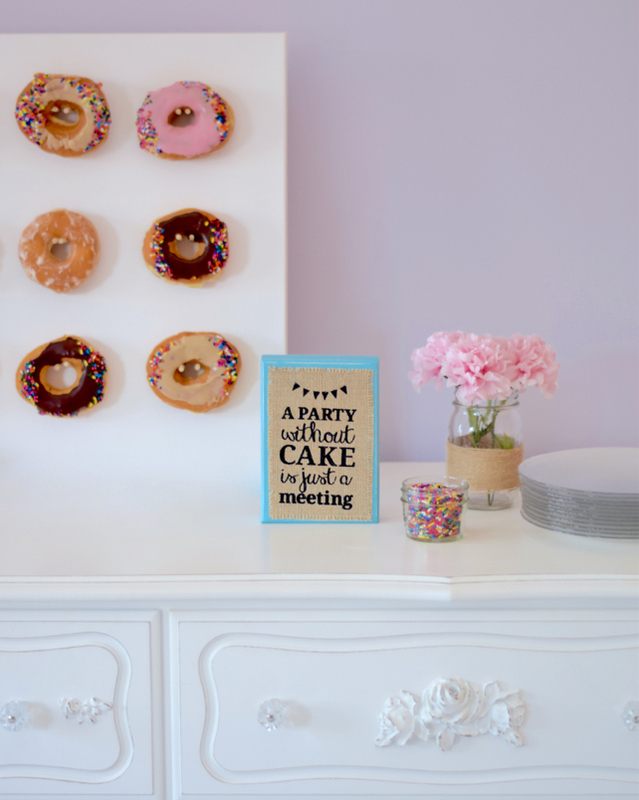 That is essential for making sure the display won’t fall over mid party! As for the rest of the DIY it’s pretty straight forward. 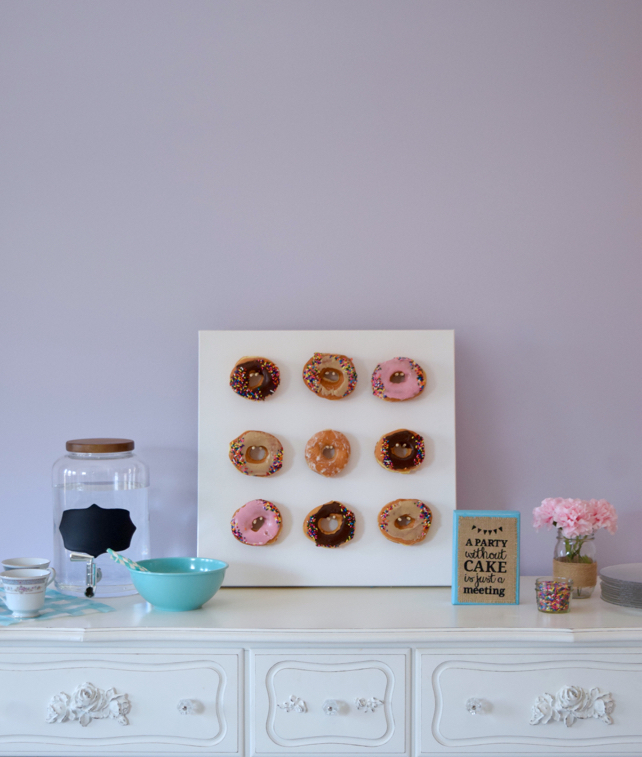 All you need is below & it’s only about 5 steps until you’re looking at your own donut wall! Step 1: Purchase or make donuts. Ok that was easy! Step 2: Measure the spots where you’ll be inserting the skewers on the canvas. Mine were all roughly 4 inches apart. Step 3: Using the fine tip end of the skewer gently push it into the canvas. 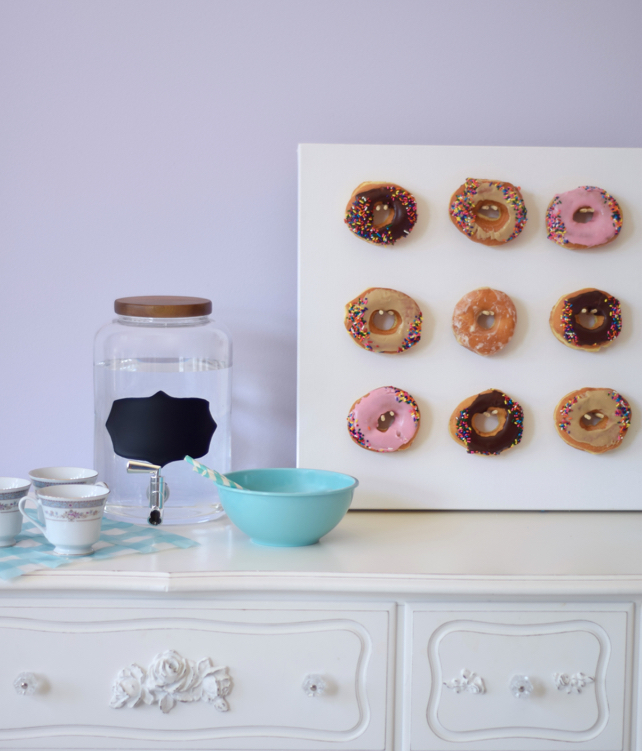 By turning it side to side, gently wiggle the skewer through the canvas so only 3 inches remain on the side you’ll be placing donuts. Repeat with another skewer about 3 cm. apart & horizontally lined up. Step 4: Warm up your hot glue gun & place glue all around the back side of the board around the spot where the board meets skewer. This will ensure your skewers stay in place. When in doubt, add more glue! Step 5: Once glue is dry (2-3 minutes) turn around & prop up in desired spot. 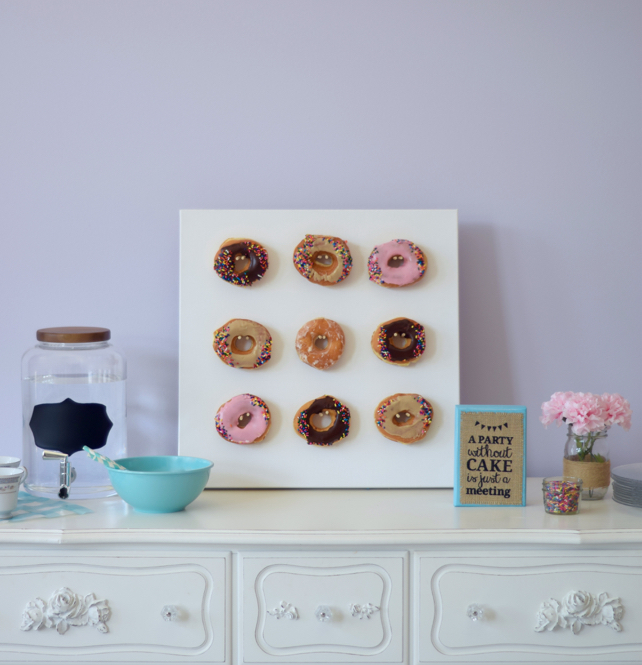 Place donuts on wall & enjoy! 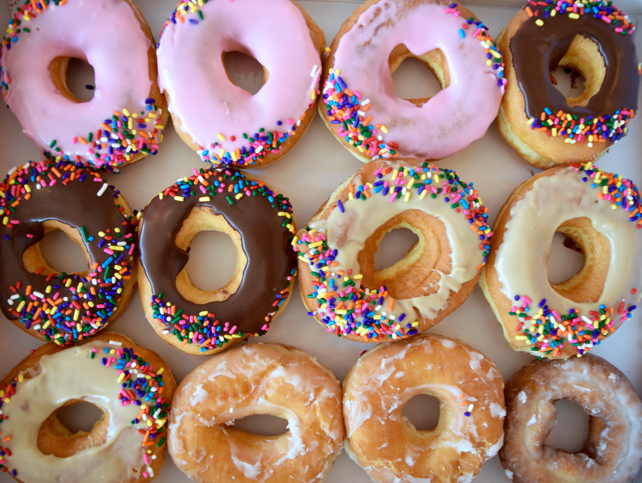 These donuts are so cute!! Yummyyyy!!! This is too cute!! Perfect for a party.